Let us enjoy looking at some lovely clothing, shall we? I am a very big fan of modern cut fashions featuring traditional motifs. The Asian iCandy shop has some of the best that I've ever seen of this genre, including lots of Yunan embroidery. All photos are via Asian iCandy. First is this dress embroidered with lotus flowers. I adore lotuses and would already have ordered the dress if it came in a size larger than 'medium'. 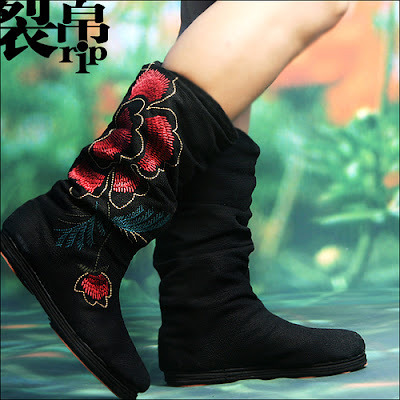 I'd have rocked the heck out of these embroidered boots under my kiras in Bhutan. This painted skirt would be perfect with a simple black top and filigree silver jewelry. Sold in one size only, I'm unsure how that would work out for me. 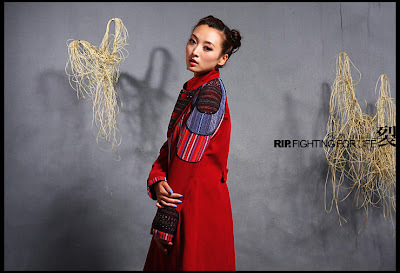 Yunan Valley maxi wool coat - so much more interesting than the puffer coats common around here. The mix-and-match coat comes in three bold colour combos. Tibetan festival scarf: would thoughts of the snowy Himalayas keep you warm this winter? love love love those Asian shopping sites! I fear that I wouldn't fit in any of it though! Everything is cut so tiny and for small chests.